My froggie toes have made their first appearance on this trip! Long live the froggie toes! What a strange, strange night stealthing in the desert last night! First, there was the mid-night pee. Greatly fearing the nocturnal sidewinders, I experienced the quickest pee ever! I exited my tent, did my thing, and then reentered my tent all within 45 seconds. And that wasn't even using the Shenis! Then there were the ants. When I laid my head down for the night, I could hear this really loud sound in whichever ear was facing towards the ground. At first I thought maybe it was my ears. But after awhile, I figured there must be a busy construction site of ants working the nighttime shift, and their construction site must be just beneath my head. To test my theory, I laid my head down in a few other places in my tent. Sure enough, there was no sound. My air mattress was serving to amplify the sound of the ants, so I used one of my shirts as a pillow to dampen the sound. Problem solved! Then there was the issue of the noisy rain fly. Though my tent is free-standing, my rain fly has two vestibules that require stakes. I was able to properly stake one of the vestibules last night, but a very pointy cactus prevented me from properly staking the other vestibule. Last night's wind was blowing the loose vestibule around, and the flapping sound was driving me nuts. I finally got up at midnight thirty to take down the rainfly. Problem solved! Without the fly on my tent, the stars were beautiful. But the damn moon was like a bright streetlight shining directly in my window. I pulled the sleeping bag over my head and finally drifted to sleep. I got a short, but deep, five hours of sleep. 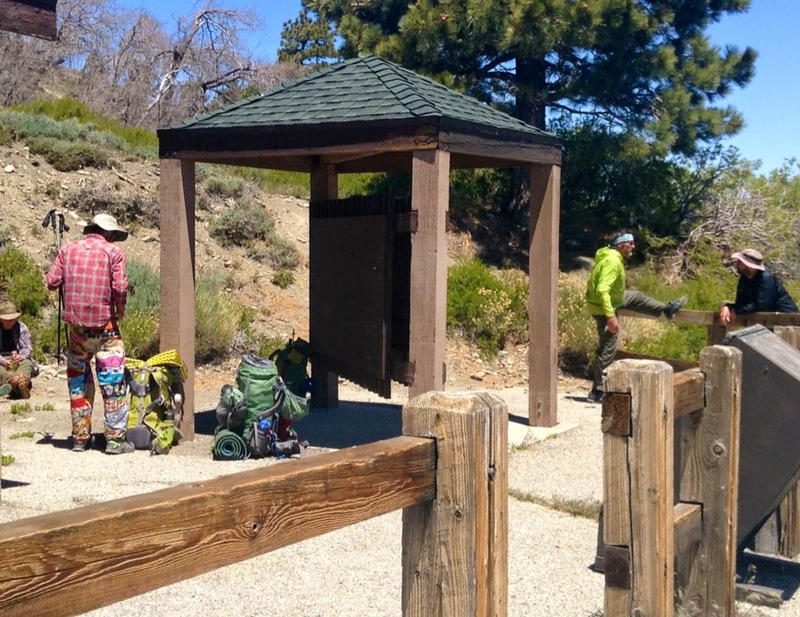 We finished our long climb into Wrightwood this morning. A barista at The Village Grind, the local coffee shop, noticed our bikes and asked about our ride. 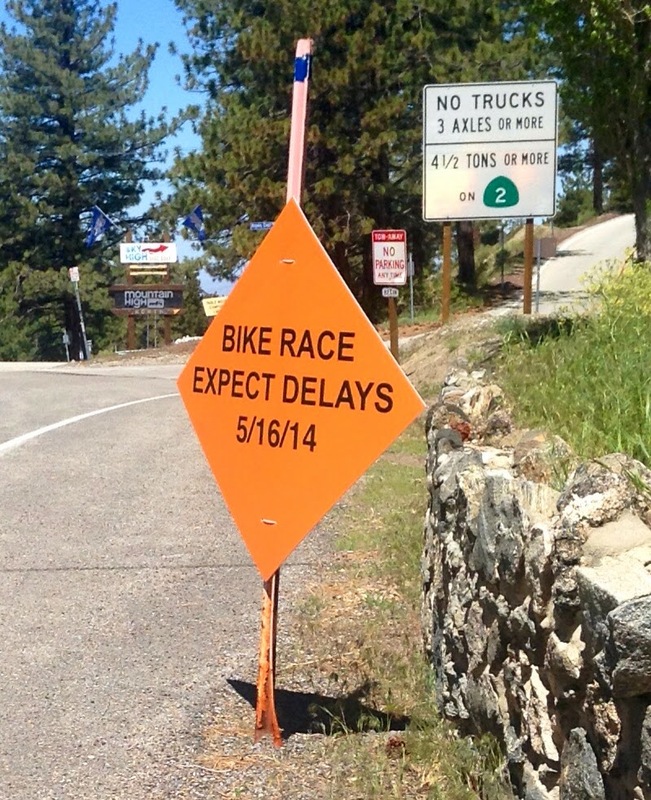 She told us that a leg of the famous AMGEN Tour of California Bike Race would be riding through town next weekend. Part of the race would be on Highway 2, the route that Alex and I would be taking out of town. 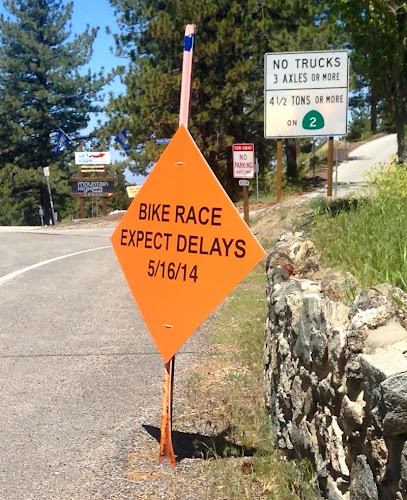 A sign for the upcoming AMGEN bike race. As we rode along Highway 2, I was imagining how different the experience would be for the bikers who would be racing along this same road in a few short days. 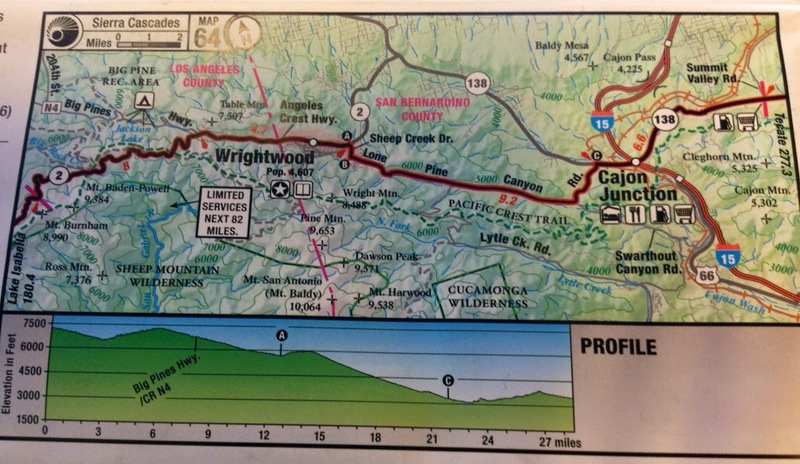 I can't imagine a more beautiful route for a bike race (well, aside from yesterday's Rim of the World Highway). This morning's map (read from right to left). Because we are traveling from south to north, we are following the maps in reverse chronological order. For each map panel, we're traveling from the right side of the panel to the left. 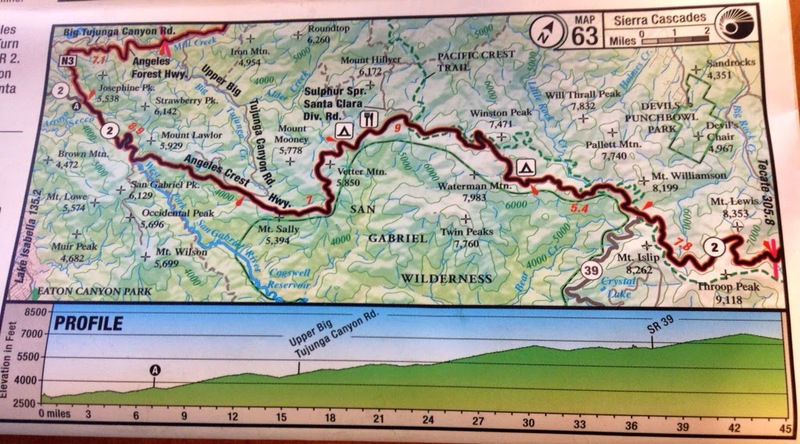 These two maps, together, do a great job of illustrating the elevation nonsense of the Sierra-Cascades route. It goes like this: climb until you have arrived at x feet of elevation, then descend x feet. Rinse and repeat. 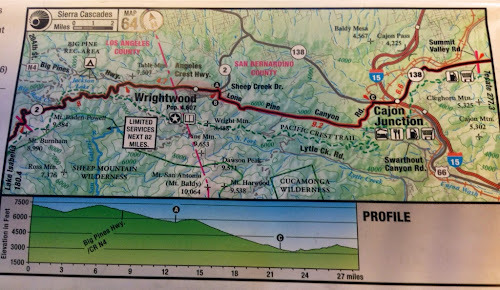 You may have noticed on the first map panel above that we began a stretch of the route today that extends for 82 miles with limited services. We're really in the boonies now! I mentioned yesterday that most of our route has had signs warning of falling rocks. With all the wind, we've heard and seen rocks falling very near to us as we've biked along the shoulder. We've joked that the falling rocks are the real reasons why we wear bike helmets. 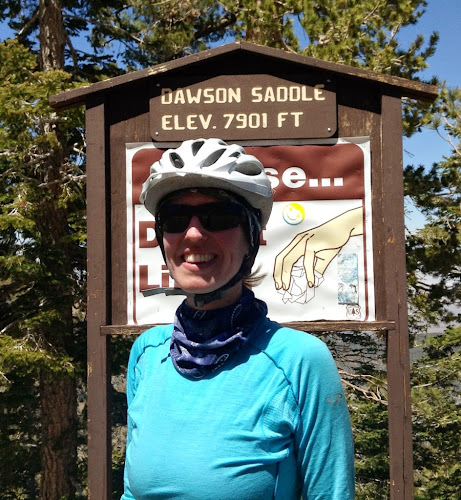 On today's descent, I felt a few pieces of very small rock debris hitting my face as I sped down the mountain road at 35 mph. I like to think of it as macro abrasion exfoliation. 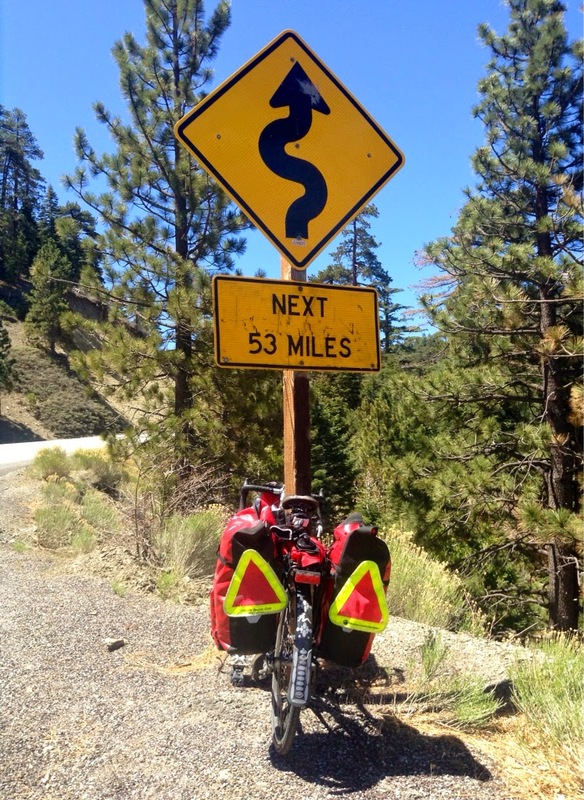 As you may recall, the Sierra-Cascades bike route parallels the Pacific Crest Trail (PCT). 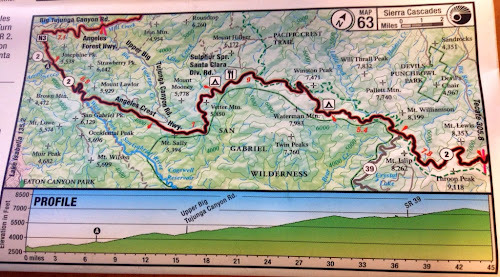 In fact, you can see the PCT on the two map panels above; the PCT is the green-dashed line. We've run into numerous backpackers on our trip, including this group of hikers at one of the pull-offs on the side of the road. We passed two 7000+ ft high points today. We didn't bother to stop for a photo at the first of these points, I suppose because the point wasn't nearly as high as our highest point yet, Onyx Summit. But we stopped for a photo op at the second point today, because gosh darn it, we earned this elevation! We earned a photo at 7,901 ft. Thank god we're not parked vehicles! 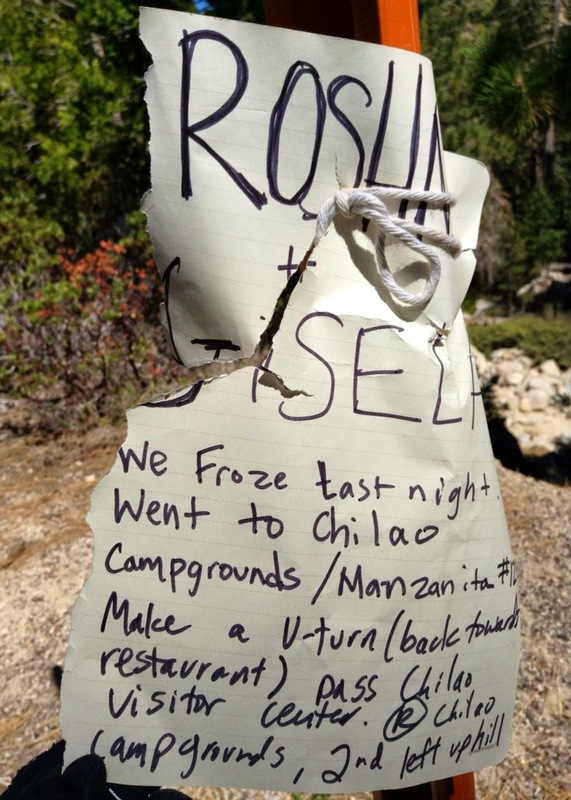 A note posted on the side of the road by PCT backpackers. Although we didn't freeze last night, we too are staying at Chilao Campground tonight. I hope the weather is treating you guys well. It's brutal down in San Diego right now -- 100s and fires everywhere. Stay hydrated! Thanks for the well wishes, Dave. When we finished our ride today, it was 97 degrees! Fortunately, we haven't come across any fires. Hopefully it stays that way. What are froggie toes? 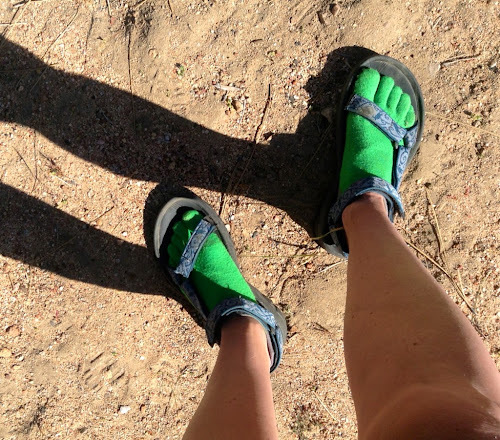 Are they green toe socks? I'm enjoying following along on your latest adventure, Sarah! Hi Kelly! Yes, the froggie toes are my green-toed socks. So glad to hear that you're following along! Hope all is well for you and your family!